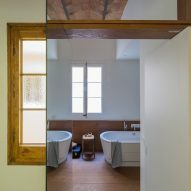 Strategically placed mirrors are used to reflect natural light and create the illusion of greater space in this compact Barcelona flat, which has been renovated by local studio Nook Architects. 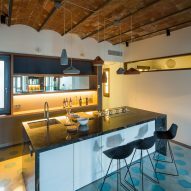 Nook Architects was asked to restore the apartment, which is located centrally in the city's Plaça de Catalunya, for a client wishing to use it as a holiday home. 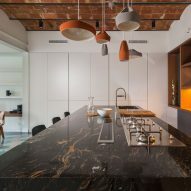 The top-floor flat has a limited floor plan of just over 100 square metres, but it features a generous number of openings that flood the interior with natural light. To emphasise these openings, the architects placed an array of mirrors around the flat's interior – influencing the project name House of Mirrors. "To increase the presence of these openings and to multiply their presence we used mirrors," said the architects. "In the hallway, which has three generous windows overlooking the building's atrium, we placed very large mirrored panels to multiply the views of these windows and to give the space a more diaphanous character," they continued. The apartment's previous plan featured a segregated layout with the living room and kitchen being divided by a load-bearing wall. By knocking down the wall between these rooms and through the use of mirrors, the architects hope to create a more opening and welcoming space. "The kitchen had to be at the centre of it all, serving as a meeting point – more of a gastropub than a family kitchen," they stated. 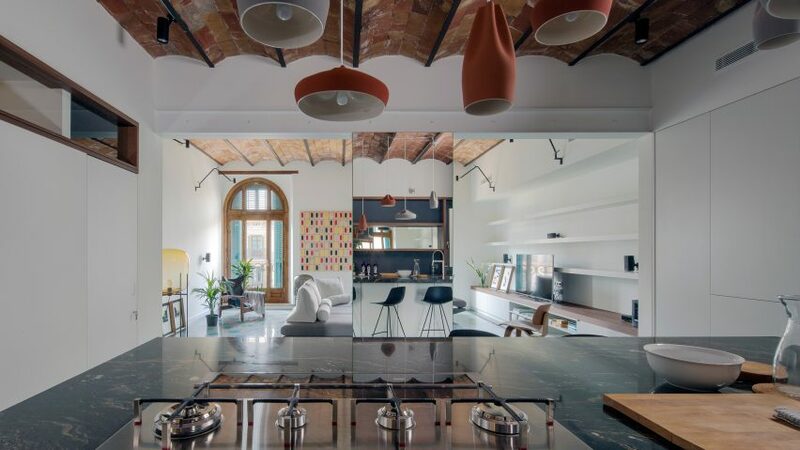 "The mirror dissolves the wall, bringing the attention to the two balcony doors and allows the cook to control the shelves behind him while he entertains his guests." Along with the living areas, the project also features an open-plan master bedroom and ensuite, as well as a further guest bedroom and main bathroom. 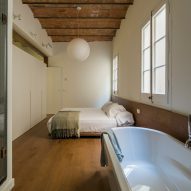 The renovation is designed to be sympathetic to the historic nature of the flat with the Catalan arched ceiling being retained. 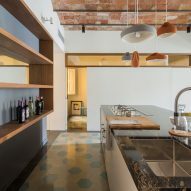 Light-coloured hexagonal tiles have been used in the main living area – referencing the original tiles, which are typical of apartments found in the city's Eixample district. Granite surfaces added to the kitchen and bathroom contrast the original features and the neutrality of the colour scheme. "Contemporary and warm finishes highlight the original envelope, which is only altered to bring back a spirit more honest to the building's tectonics and to allow it to evolve to today's standard of comfort and living style," said the architects. 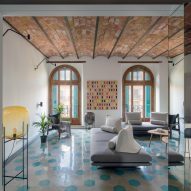 Nook Architects is based in a self-designed co-working office in Barcelona's Poblenou district. 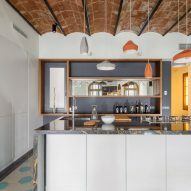 The studio has completed a number of apartment restorations in the city, including a 20th-century flat featuring barrel-vaulted ceilings and exposed brick walls.